Eventually your exterior door lock will wear out. At the very least it’ll become so infiltrated with dirt and grime that it’ll grow stiff. Sometimes it’ll freeze up because of this dirt, but at other times your key will get stuck in it. Fortunately, there are several things you can do to prevent this from happening without hiring a locksmith. There are many lock-lubricating products readily available for sale at your local retail hardware store today. These include things like graphite powders and Teflon-containing sprays. With so many different options available, this could be the most difficult part in the process – finding which product you want to use. However, your local locksmith should be able to give you some advice here. When you talk to one you may find that they advise you not to use an all-purpose lubricant like WD-40. Although this was a very popular option to use in the past, there’s been some evidence that WD-40 simply evaporates into residue and when it does it’ll attract even more dirt and grime. Whether your locksmith advises you to use a dry powder or a liquid-based product, you’ll want to make sure that you follow the instructions and heed the warnings that are on its label. Typically, it’s as easy as placing a nozzle or a tube into your keyhole and releasing some of the product. When you do so, make sure you get as much as possible into the interior lock mechanism itself. Afterwards use an old rage or a paper towel to clean up any excess. When working with a lock that’s in a door handle, make sure you turn the handle back and forth several times. For interior locks, you’ll want to flip it several times to both lock and unlock the door. It’s important to do the same thing with a dead bolt lock. Doing so will make sure the lubricant reaches all the lock’s moving parts. Make sure you clean up any overspray or runoff and wipe down the doorknob and dead bolt. Also make a mental reminder to do this on a yearly basis. However, you should know that when all else fails, you may find that you still need a locksmith. 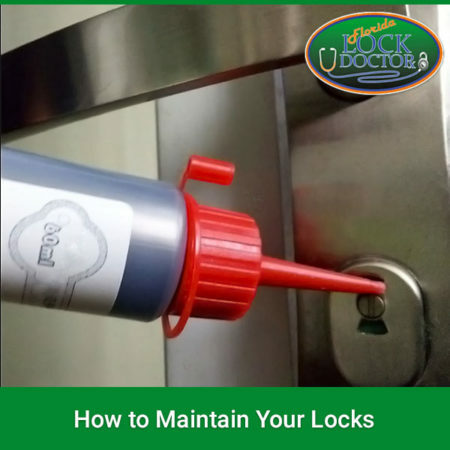 If you live in Florida, you should give the Florida Lock Doctor a call. Over the years they’ve helped many clients and you should be next.